This is a very simple, but delicious way of making quick jam, without all the stirring and waiting that traditional jam making involves. The roasting brings out the natural flavours of the strawberries, and also gives the jam a wonderful caramel flavour. One of the best ways of sterilising the jam jars is to wash them in the hottest setting in the dishwasher, then place them in a hot oven for about half an hour. Served with lashings of greek Yoghurt, this recipe is the ultimate sweet treat. Preheat the oven to 200°C. Hull the strawberries and place them in a large pyrex heatproof dish or a non-stick roasting tin. Slice through the vanilla pods lengthways, and open the pods. With the back of a knife, remove the vanilla seeds, and mix the seeds into the caster sugar. Place the empty vanilla pods into a jar of sugar, and the aroma will scent the sugar, for cake baking. Place the vanilla sugar in a separate pyrex dish or non-stick roasting tin. Place both the sugar and the strawberries, which are on separate dishes or tins, in the oven, and roast for 30 minutes. The strawberries will start to go soft, and the sugar will be hot. Remove from the oven. Combine the hot sugar and the soft strawberries. The heat of the sugar will make the strawberries melt into a gooey, sweet jam. Cool the strawberry jam. Fill the sterilised jam jars with the strawberry jam, and cover the jam with a small disc of greaseproof or wax paper. Then close the jars tightly, and label with the name of the jam and the date. You can store the jam in a cool, dark place, and it should keep for a good 6 months. 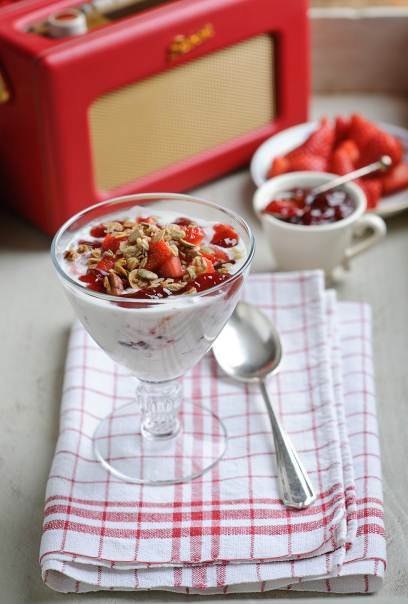 Serve the jam spooned over Greek yoghurt in small serving bowls with a sprinkling of granola and chopped strawberries.